Trend trading has no edge .An edge is present before any trade is placed.You have zero edge , unless you have a mental edge .All your illusion edges are worth zero , if you can't execute your edge.Trend trading is similar to a forward in a football game, and support trading is similar to a defense player, neither has an edge until they win by scoring a goal. The Bitcoin has a trend at present, there will be many who will get caught buying the tops, unless there is a sound practical approach to making the money. a) The original Mr Richard Dennis Mr trend trader, eventually lost money . 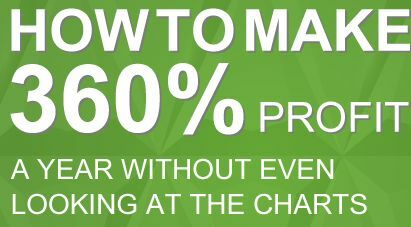 b)Market ranges 80 % of the time and most trends will fail 80 % of the time, so you have 20 % chance of making money.If you are short biased on stock markets, these chances reduce to 10 % success rate. c)Trend entry market timing is extremely difficult both psychologically and technically.An example of this is Bitcoin . Most traders are sold trend trading courses and education , but 95 % lose . 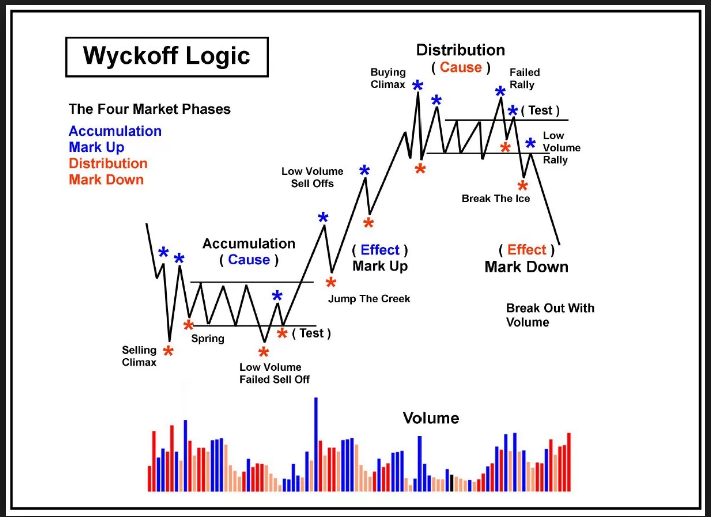 The first and the best depicts Wyckoff's market cycle. Shows how trends start and finish and so how to ride the trend. Now a well established theory originally written in 1910 has been updated by many authors since which may be easier to digest. The real market does behaves differently and has multiple variations of Wyckoff. We can sing as much as we like about trend trading and technical analysis, but none of this singing makes any money, unless there are clear examples with entry /exit instruction on live journals , so someone can apply it and makes money or lose it. What is your current trend trade based on it?Mine is Dow . New traders should learn by themselves , and they should spend 6 months in live markets to observe for them selves. But your chart (what detail can be made from it) shows exactly range and range expansion behaviour, this is the basis of Wyckoff. The model in my post shows both up and down phases but that's just a model, there is no reason that up phases can not be stacked on top of each other so thanks for proving my point. 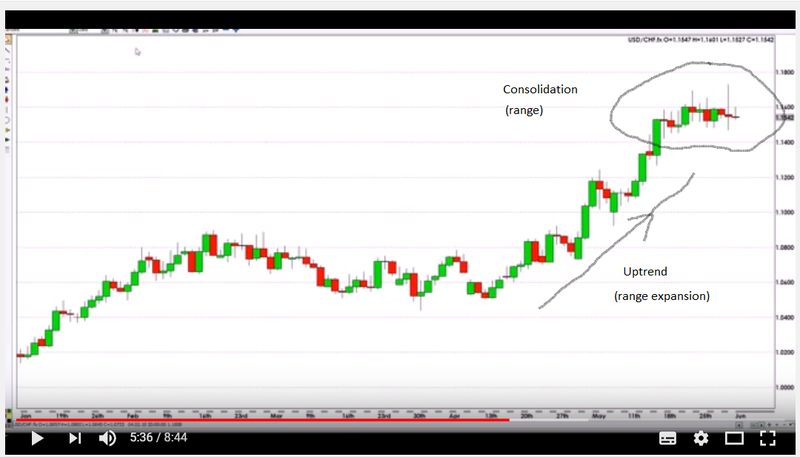 This is what happens in long term up-trends, up tend > consolidation > up trend. Wyckoff and Dow provided the basis for chart reading that is still used a hundred years later, you are using it whether you realise it or not. As for the list of famous traders who have made money from use of the model over the last hundred years, too huge to even bother starting. This is making a very simple support trading system , too complex and confusing to operate. Where are the audited certified accounts to prove these theories? You don't use accounts to prove theories, they either stand the test of time or are disproved by subsequent events. The very fact that you are using a simplified version in your strategy proves it continues to be valid. William Oneil was never a trader, he was a guru a stock guru who ran a brokerage.He teaches through his books. Phyllis (1977) "Those who can do. And those who can't...teach through books !" Quite right, this shows why you can't use a trend following technique like yours to trade a range, and why you must wait for the next range expansion phase as per the Wyckoff model discussed earlier in this thread. So you might as well forget this trend buy high sell low and lose money style of trading. I see you choose an abnormal example where price gapped up over a weekend. highly volatile illiquid instruments also have gaps intraday. But it still worked anyway didn't it, besides a model is not a template. And you must be aware most gapes get filled. Within a 10 year span most get filled!The sun rises everyday , almost everyday. Let us stop singing about t/a .In this case we can say " the trend is your friend , but you can't always time the entry"If market timing was possible, more often than not, every little monkey would be a billionaire, cause would get in before the trend breaks out. 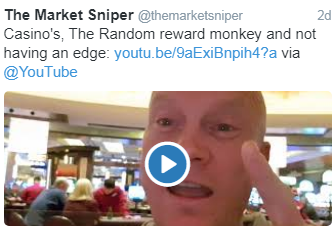 Have you been watching themarketsniper videos? He has another snake oil formula, because if he was any good, he would not be doing the video. The entire trading industry if full of people selling " the map to the trading gold" .Internet marketeers to educators, are all willing to lead, honest traders down the wrong path, are all guiding traders to lose money. 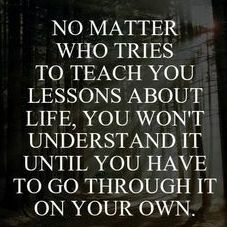 People who are not qualified to educate traders, advise traders and mentor them, are doing exactly that! This is why I trade trends occasionally, but trade supports .If people like Covel can't make money trading trends, how can others?They are the leaders and gurus. So much misinformation on forums. Performance at Henry’s firm has lagged over the past several years and assets under management have dwindled. Last weekend I decided to give all my books to charity.I have read over a hundred of them . The book writers are no better than anybody else in the trading industry, they are all blind leading the the blind.The authors are only making money from writing, in many cases they are just forum traders trying to sell education after writing a book. Bob Volman claims to be a professional trader, yet he is not billionaire from trading.He makes money from writing books on amazon, he will probably write more books and earn more money from amazon. I listened to advice on forums and bought his book.Forex price action scalping.I believe he may or may not work on trade2win forums using some forum stooges to post or a forum name . Money in the gold rush was made by selling maps, picks and shovels , in the trading industry gold rush it is made by selling books(maps),seminars (maps), education(maps) ,software (maps)and signals(maps) .The trading industry is full of rogues . 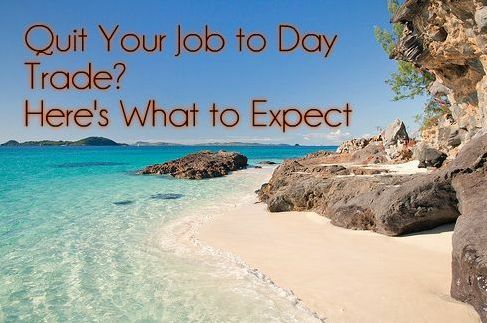 If a good trader can earn a simple 30 pips consistently a day from trading , a trader can become a billionaire in 5 years. Most FX traders cant even make 30pips a month (or year) let alone per day. 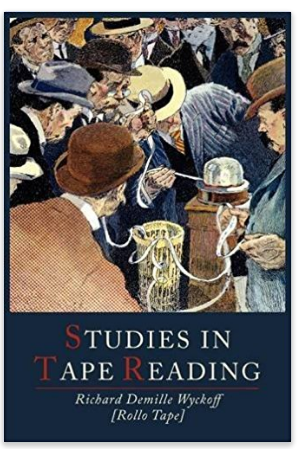 I bought Marcel Link's book , but later discovered he makes money from selling education. 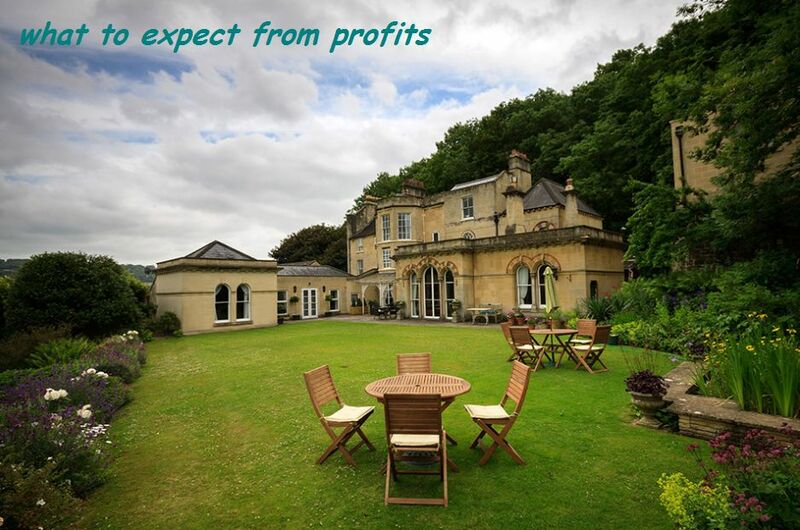 Trading industry provides quite luring opportunities to earn risk-free, by teaching new traders. As far as there are wannabe traders who can afford education. But this education goes to the level of qualification of mentor . @PandaFace and @rimmy2000, I started this topic nearly a year ago which may be of interest to both of you. One of the books that I would like to read and finish this year is The Intelligent Investor. I am a quarter of the way through and I am reading it with an open mind. Another book is Trading in the Zone by Mark Douglas. I am on holiday for a month abroad so I may take that with me but not sure whether I will actually get an opportunity to read it. It has been highly recommended by many last year to me within the IG Community. I think some of you are missing the point. Michael Covel is a marketeer and a good one at that too some would argue. He has never claimed to be a trend follower himself. He simply presents the people who have actually made millions of dollars in profit in his books. He introduced real people most of whom were or still are billionaires to the reader. They made money using trend following and this is described to us in his books. Jack Schwager's Market Wizards and New Market Wizards is another very good example of how the reader gets to learn about successful trend followers and learn about any mistakes they made but ultimately how they made their millions in profits using such a strategy. I am an advocate of trend following but accept that it has its issues and limitations as well in certain conditions. I think the investor / trader has to create an individual style suited to them. It may mix fundamental analysis with momentum investing with a dose of trend following based on technical analysis. Actually, no, he doesn't "simply present the people who have actually made millions...." He sells expensive trend following courses, costing thousands of dollars. Someone who sells courses for thousands of dollars should have a trading record but he does not have one, or if he does, he refuses to publish it. @JamesIG, first of all can guests now post on IG Community? Guest Khingo Bhingo, yes he does sell trend following courses costing thousands of dollars. Whether this is expensive or not is based on personal opinion. If the courses makes someone thousands of dollars then one could argue that it was money well spent. I am not an advocate of such course and nor would I ever suggest anyone purchase them. There is enough free material out there to read which can give you a knowledge on trend following without the need for purchasing such courses. If someone cannot be bothered to make their own trend following trading plan then they really should not be trading. Why should he have a trading record? If there any law that suggests that one must have a trading record to sell trading courses? He is using information obtained from experienced and successful traders and trying to include them in the courses he offers. The owner of a pharmacist does not need to be a qualified pharmacist themselves. They can employ qualified pharmacists. The same applies for the owner of a chartered accountancy firm. They do not need to be a qualified chartered accountant themselves. They can employ them. It is not Michael Covel that is important so too much time should not be wasted on him. He is merely the individual presenting the trend following information to an audience. It is the people he has interviewed and what they have to say which is important. Yes - guests can post on Community, however all posts need to be verified by a moderator. We look out for posts which look spammy or don't add value, but if a post futhers the conversation, providers an alternative point of view, adds value, offers thanks, or is interesting then we will 'approve it' and let it show publically. Absolute priority is given to quality over quantity, however in my opinion over the last couple weeks this option for guests to post has been beneficial and added value to the community. Interested in others thoughts. @JamesIG, thank you for your quick response and clarification.